An hourglass shape, also known as a re-entrant contour. 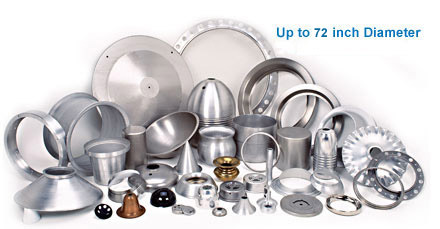 Spun metal parts from HMS range from the size of a thimble to a large satellite dish. Our manual spinning lathes can swing up to 72" in diameter, while our automated, state-of-the-art CNC spinning lathes can accommodate a starting disc size of 50”. HMS spins metal parts with wall thicknesses of up to .187" in stainless steel or .315" in mild steel. Exotic metals such as titanium, Hastelloy®, and Inconel®. Regardless of whether your print calls for the manufacture of a new part, or quality and price concerns have you searching for a new manufacturing technique for an existing part, metal spinning can offer significant advantages over other metal fabricating processes such as metal stamping and hydroforming. Multiple operations can be performed in one set-up, eliminating costly secondary set-ups. Dimensional and geometric changes during prototyping are achieved at less cost than with traditional metal forming techniques. Metal spinning is ideal for complex geometries, including re-entrant profiles. Typical spun metal parts require less tooling than stamping. Metal spinning can be automated with CNC lathes. Spun metal parts are seamless and cold working associated with metal spinning increases strength. If your design requires a custom, seamless shape, consider HMS for your metal spinning needs. Getting started is as easy as sending your drawing. To learn more about spin forming or to request a quote, contact Hialeah Metal Spinning today! *Hastelloy is a registered trademark of Haynes International, Inc. *Inconel is a registered trademark of Special Metals Corporation.